A wide selection of innovative sushi is delivered via conveyor belt. Open Sun.-Thurs. 11:00 a.m.-12:00 a.m., Fri.-Sat. 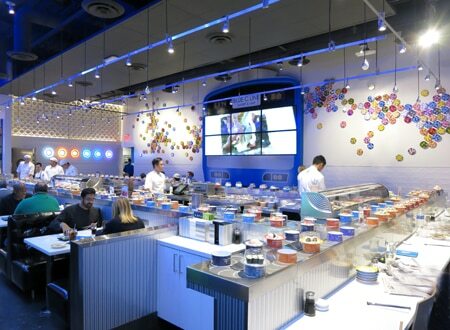 11:00 a.m.-1:00 a.m.
: Blue C Sushi offers sushi and Japanese small plates via a revolving conveyer belt, a system known as kaiten-zushi in Japan. An RFID chip in each plate ensures nothing stays on the belt too long. There is usually a wide selection of nigiri sushi, sashimi and specialty rolls like the “surf & turf” (grilled teriyaki beef and asparagus with Vietnamese chili sauce) or the “Blue C” (spicy crab topped with tuna and tobiko caviar). Be sure to try signature items like yellowtail tacos and the "loaded baked potato" sushi (Japanese potato salad with bacon, cheddar, sour cream, caviar, chives and bonito). You may also order scallops or oysters from the raw bar, or request something you don’t see on the belt, like vegetable tempura or teriyaki salmon. 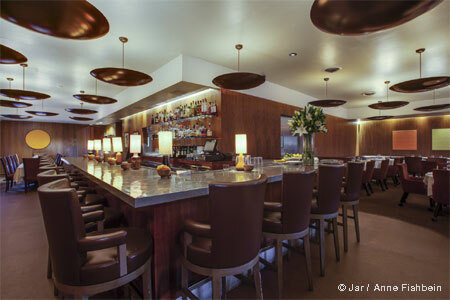 Wash it all down with saké or specialty cocktails, and finish with a chocolate brownie or mochi ice cream. Blue C Sushi, with its colorful mod décor, is part of a growing chain based in Seattle.